Late last night--when people get real work done--Poor Old Baseball Cards reached into Cuba's past and pulled out the vintage tobacco set 1946-47 Propagandas Montiel. I couldn't help but follow suit, given the issue's unique look. As the P.O.B.C. blog entry mentions, this multi-sport tobacco set leans heavily, but not exclusively, on baseball. 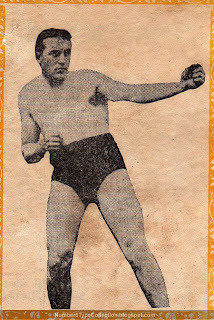 Number 5, in fact, featured early 20th century pugilist Tommy Burns. Now a member of boxing's International Hall of Fame, this youthful pose shows off the standard fighter physique for his day. 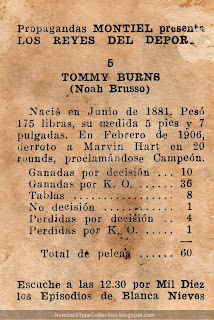 Besides holding the crown for some time, Tommy's known for accepting a title challenge from Jack Johnson, who beat Burns in Sydney, Australia to become the first African-American heavyweight champ. As with most Latin American sets, Propagandas Montiel also produced an album to hold the paper-thin cards. You'd mount them to a page like stamps, which usually meant a messed-up back when removed. Fortunately, the #5 that turned up at a show last year only showed corner damage. The special albums and paper stock made this more like a North American stamp set. Topps did several of those, but rarely put this much editorial effort into it. I like the Propagandas' design and its checklist of 180 cards includes a number of luminaries. See the Century Old Cards site for front-and-back scans of #73, Carl Hubbell, and some additional set details.